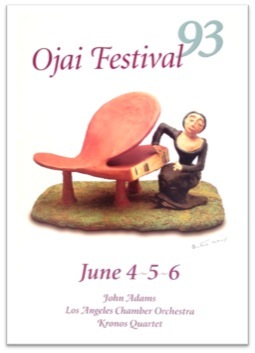 As Libbey Bowl is about to come alive once again with the magic sound of music, we take a look at some of the art posters created for the Ojai Music Festival: as a group, they give us a bird’s eye view of the Music Festival’s history and tell us stories about the events, programs and performers. In the 66 years the annual summer festival has played to devoted, adoring crowds of music lovers from Ojai and far beyond, a number of original posters were created. 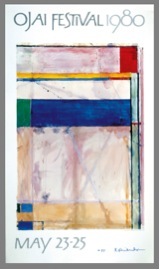 The more memorable works were produced between 1975 and 1995. Posters have a long history as a medium combining art, graphic design, location and events. The tradition of producing posters for marketing and for fund-raising is well established in the world of the performing arts. But what exactly is a poster? Many use the word loosely when referring to any print or reproduction. Let’s try to define the term as what it truly describes. POSTER in English is AFFICHE in French, PLAKAT in German. These words describe the literal action of affixing, gluing something on to a support. That is the primary function of a poster: a single sheet of paper, printed on one side only, is posted on a vertical surface to publicize something through a clear message combining words and images. How and when did posters appear? Broadsides (i.e., small size posters) produced with typographical design using hand-letter presses appeared as early as the 16th century. Ephemeral by nature and in purpose, broadsides were used for dissemination of a wide variety of ideas and events, official and individual proclamations, poetry, etc. They are valuable as refined examples of popular art and reflections on the culture of their day. The revolutionary discovery of color stone lithography by Jules Cheret in Paris around 1865, and its technical evolution over a few decades into a means of mass communication, led to the development of posters as a new and modern art form. By 1900 buildings in Paris, Berlin, London, Vienna, and New York were covered with larger posters advertising department stores, perfumes, automobiles, bicycles, magazines, operas, concert halls, theater shows, fine foods, and travel. Plastered on walls, on construction sites boards and on kiosks specially designed for that purpose, their emergence in the street life of cities transformed the urban landscape. Posters became a popular medium for advertising in an artful manner. A few artists (Toulouse-Lautrec, Bonnard, Steinlen, Mucha, et al) developed a passion for the stone lithographic process and its ability to produce multiple copies of one work fast and cheap. They also fell in love with the Japanese woodcuts first exhibited in Paris in 1889, fascinated by their esthetics and adopting their approach to bold composition, negative space and simplicity. These attributes are some of the key elements of an effective poster design. The new art form quickly found an audience of avid collectors. Many gallery and museum exhibitions were already recording their growing popularity in the early 1900s. Form and content changed at accelerated speeds throughout the Art Nouveau and Art Deco periods. The presses were running, and the names of Le Moulin Rouge, Le Chat Noir, Aristide Bruant, Mistinguette, Josephine Baker became famous through their now illustrious poster images. WWI and WWII provided an explosion in bold, patriotic, political poster designs. After WWII a true renaissance of the fine lithographic printing occurred essentially through the skilled efforts of one man: Fernand Mourlot and his printing studio in Paris put lithographic stones and tools in the hands of contemporary artists (Braque, Picasso, Matisse, Chagall) teaching them and many others how to draw on stones to create original graphic works. That led to an abundance of brilliant original limited edition fine prints and poster designs created by these artists for their publishers and exhibitions in the 50s and 60s. The trend spread like wildfire to the USA where new lithographic and silkscreen studios opened their doors to work with artists on fine prints (Tamarind Lithography Worshop, Gemini G.E.L., ULAE.) Pop art was hot in the 60s and 70s, and production multiplied on both coasts. Rock artists produced psychedelic concert posters in the Bay Area; Warhol was experimenting with every ink in sight in New York; while others like Robert Motherwell, David Hockney, Kenneth Noland, Richard Diebenkorn, and Jim Dine were creating some of their finest original prints, and occasionally posters for art exhibitions and cultural venues. 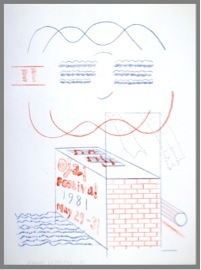 Many of the posters created by these masters for the OMF in the 80s were sometimes signed and numbered, and they are by now quite rare and valuable. Original vintage posters have generally become quite collectable. They are represented in major museum collections worldwide. Reference books,specialized auctions and catalogues abound on the topic. A new breed of collectors (private and public) have turned their attention to the more recent examples of the Modernist and Populist styles coinciding with the renaissance of fine printing and design as â€œartsâ€ after the 60s. Ojai is a small town. Yet at a time when most places witness the disappearance of posters due to the ever-growing dominance of digital communication combined with the increased costs of paper printing production, Ojai holds the tradition of producing posters for local events such as the Ojai Music Festival, Ojai Film Festival, Lavender Festival, Wine Festival, Ojai Day, the Art Museum, and the Art Center. Ojai is also a place unlike any other: rustic, intimate, culturally sophisticated, it is revered by the visiting composers, musicians and conductors coming to the Music Festival. Who could forget Dawn Upshaw’s profoundly moving lyrical ode about why she so loves coming back to sing in Ojai? Beatrice Wood was world renowned. She moved from Los Angeles to Ojai in 1947, like so many other devotees of Krishnamurti and his annual talks under the oak trees. 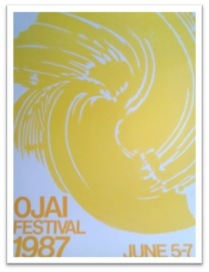 Coincidently, 1947 was the inaugural year of the Music Festival in Ojai. Beatrice spent the rest of her long life in this valley. Her studio had become a cherished destination – almost a pilgrimage – for art lovers, writers, Hollywood celebrities. She did not travel much, but the world came to her. When she passed away in 1998 at the age of 105, she was the most celebrated ceramic artist of Ojai and one of the significant ceramic sculptors of the 20th century. Her contributions to local non-profits in the arts included the OMF, the Ojai Library, schools, and almost every organization which solicited her support. She believed that arts and education can change lives. They can, and they do. Beatrice generously walked her talk. Her 1993 concert pianist poster for the OMF is bold, at once provocative and charming, just as she was. 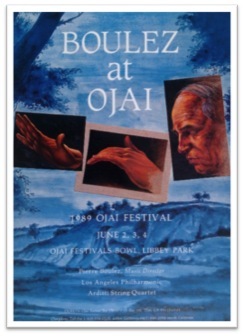 Two posters, 22 years apart, shine the light on Pierre Boulez, one of the brightest stars in the Festival’s history. The 1967 poster is using limited means, typographical design mostly and two colors (the classic red and black associated with broadside-type posters). The 1989 design by John Nava makes dramatic use of the four-color process offset printing to visually evoke the ambiance of the festival. A dreamlike atmosphere sets the stage in the blue/grey background against which three inset images – painterly renditions of the conductor’s face and hand gestures – come to life illuminated against a Midsummer Night’s Dream nocturnal atmosphere. That’s what it feels like, in the night, under the oak trees in Libbey Park, when Boulez conducts in Ojai. 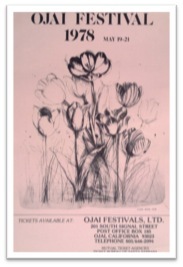 Both Jim Dine’s and Jack Youngerman’s posters focus on flowers. Appropriate symbols for the setting of the festival in the idyllic natural beauty of the fertile Ojai Valley. Dine’s delicate composition draws the viewer’s eye in a subtle seduction, while Youngerman’s luminous two-color silkscreen explodes with yellow petal power in our face. The visual range represents well the musical diversity offered at the festival year after year, from the intimate classics to the cutting-edge contemporaries. As the applause slowly subsides and the stage lights fade away, music lovers slowly, very slowly, walk out of Libbey Bowl, folding their blankets and absorbing the discoveries, surprises and joys experienced during that particular weekend. Most of us retain magical memories of specific performances. 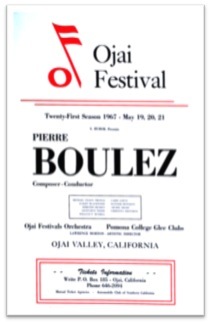 Who can forget Boulez conducting his own spellbinding Dialogue de lâ ombre double while the Ojai birds punctuated the elaborate acoustics of the composition with their own musical score? Our memory replays those high notes for years to come, words and images, sounds and lights. The vibrational quality of music is enriched and amplified by a natural environment unlike any other. The palpable experience of those moments shared with other music lovers enters our emotional and body memory. Music is a most evanescent art experience. What remains of these intangible moments? Sometimes a poster, ephemeral art from that year’s Festival, triggers a smile and a treasured reminiscence. Powerful posters do that well.